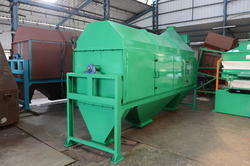 Our product range includes a wide range of rotary drum sieve/maize cleaning machine. The range of Rotary Drum Sieve offered by us is the simplest form of screening machines used for pre-cleaning the seeds and other food grains. Consist of superior quality raw materials, these are attached with rotary brushes which keep the sieve neat and clean. With an aspiration system, these products provide the dust free working facility. These are also enabled with inbuilt special rotary sieves which offer high-quality grading of various seeds and food grains.